And there are two primary goals it'll have to make: weight loss and improved fuel economy. Now that there’s an all-new Cherokee and a revised Grand Cherokee as well as the entry-level Renegade, Jeep is turning its attention to its signature model, the Wrangler. We’ve known for some time that a redesign was in the works, but now more specific details are coming to light. 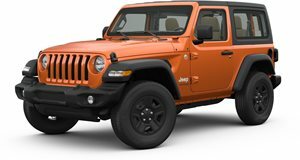 Expected to arrive for the 2018 model year, the next-gen Wrangler will focus on two primary things: weight reduction and fuel economy. Jeep CEO Mike Manley told Edmunds that "we must be innovative in terms of what we do for the next Wrangler because clearly we have to make sure that vehicle survives into the future. It is vital for the brand." Basically, the challenge is not only to meet those two aforementioned goals, but also to guarantee the Wrangler’s off-road ruggedness and abilities. The current engine is a 3.6-liter V6 and Manley promises that we "will see continued improvements in powertrains." Fortunately, he also made clear that "there will be no compromises. It [the Wrangler] has to be on its own architecture. When I think about the next-generation Wrangler at this moment in time, we are the benchmark, so I want to push that benchmark even further."